San Francisco, California—July, 24, 2012— Award-winning, plus-size American designer brand IGIGI by Yuliya Raquel has released a luscious Pre-Fall collection that will make full-figured ladies around the world go wild. Inspired by exotic Indian design elements and sensuous ancient Greek draping, Head Designer and Creative Director Yuliya Raquel has created a collection that exudes opulence and lavishness. By now all of my readers should know that I’m IGIGI’s biggest fan so I am ecstatic about the new pre-fall items. The Collection is now available at www.igigi.com. “Our fans are definitely in for an amazing experience! I tried to give them a look and feel that combines the richness and beauty of these two unique and different styles with my modern and feminine interpretation of their cultural influences. I wanted to create a collection of glamorous yet versatile pieces that will serve the various lifestyle needs and desires of fans around the world. I hope they love showing the pieces off as much as I loved designing them!” said Yuliya Raquel. The Indian theme offers dresses with exquisiteembroidery and beadwork as well as exotic prints and textures while the Greek theme carries goddess influenced draping, and fabric manipulation to enhance the beauty of the curvaceous and voluptuous figures. The silhouettes are timeless yet modern and can be easily worn from day to evening. The transitional pieces are versatile to be worn on their own between seasons or styled with layers as we welcome Fall 2012. 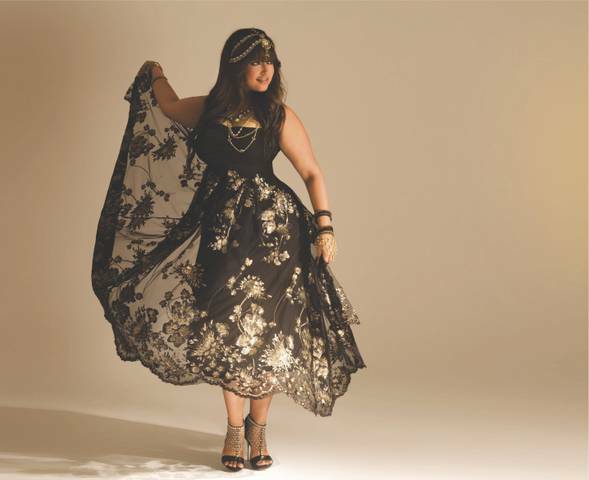 Headquartered in San Francisco, Ca, IGIGI by Yuliya Raquel was founded in 2000 with a mission to transform the world’s view of beauty by providing full-figured women with fashion-forward, quality, and well-fitting clothes that would help express their beauty. Collections are designed in-house and produced locally through independent San Francisco Bay Area contractors. IGIGI by Yuliya Raquel has been featured in major fashion and life style magazines like Marie Claire, The Oprah Magazine, People StyleWatch, Ladies Home Journal, Glamour, and Essence, and it has been a favorite among celebrities such as Nikki Blonsky, Kim Coles, KayCee Stroh, Jill Scott, Kelly Price, Ashley Fink, Martha Wash, and Gabourey Sidibe. IGIGI by Yuliya Raquel collections are available online at www.igigi.com and select boutiques worldwide. IGIGI by Yuliya Raquel was honored with the Best Plus Fashion Retailer of the Year award (Full Figured Fashion Week, June, 2010), and made Internet Retailer’s Top Hot 100 list (December, 2010), and received About.com Critics’ Choice Best Plus Designer Award (March, 2011).